‘The goal of the Palestinian people is the realisation of their inalienable national rights in their independent State of Palestine’, said Palestinian President Mahmoud Abbas at the UN General Assembly yesterday, Friday 23rd, where he also announced the formal submission of Palestine’s bid for statehood. 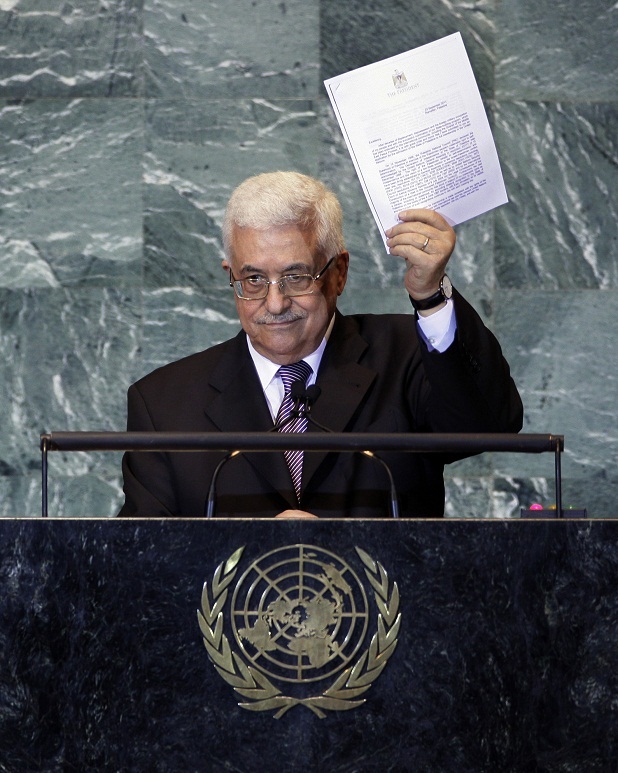 It seems, however, that despite the clear parallels drawn in Abbas’ speech with the “inalienable rights” of self-determination of the US Declaration of Independence, his words will not overturn US government positions. These positions seem to be neglecting a most salient and interesting fact – Palestine’s bid does resonate with the majority of Americans (45% for; 36% against), according to a BBC’s 19-country survey released on 19 September. Anxiety gradually reaches its climax in the Big Apple in the expectation of further developments on Monday, when Palestine’s bid will be discussed by members of the Security Council. In the interim, much of the world is left to savour not only a most definitive US veto, but also the idea put forth in the last couple of weeks by US and Israeli representatives, that is – that the path towards peace between both countries lies not in a diplomatic approach trough the UN. This position was reiterated by US President Barack Obama during his speech at the UN General Assembly on Wednesday, according to which ‘there is no shortcut to the end of a conflict that has endured for decades.’ He went on to firmly reinstate US friendship towards Israel and to talk about the plight of the Jewish people, their suffering and the holocaust. Incidentally, there was a rather effective ‘shortcut’ taken by the US to end the bloody conflict of the Vietnam War – or US occupation – that endured for almost two decades… immediate and total withdrawal from Vietnamese territory. One is thus left to wonder if this would not prove a valid solution to the Israeli occupation of Palestinian territories. In short, for the US and Israel, this is a “bad peace”, if there ever was such a thing. On such basis, we are told, the US will, if necessary, veto Palestine’s proposal. It is perhaps ironic that Washington should be (admittedly after the fact) at the forefront of the loud cheers for ‘shortcut’ regime-changes (took only 18 days in Egypt, after 30 years of Hosni Mubarak) and immediate self-determination in other parts of the Middle East – such as in Libya, Iraq, Afghanistan and Syria – while standing on the other side of the fence on this particular matter, leaving Israel and Palestine to resolve their differences at a highly tilted bargaining table. Firstly, why is it a “bad peace”? ‘Because the United Nations cannot create an independent state of Palestine’, US ambassador to the UN Susan Rice told Al Jazeera in February in the midst of a UN Security Council Resolution that called for an immediate halt to what it called the “illegal” building of Israeli settlements into Palestinian territory. Obama vetoed it unilaterally. But was not the creation of an independent state of Israel ushered by the League of Nations’ 1922 Mandate for Palestine, and later eased by its successor, the UN, with its 1947 Partition Plan? If so, then surely the UN is – as it was for Israel – the best organ to reach the goal of an independent Palestinian state. Secondly, does this so-called “bad peace” reflect the overall sentiments of the Palestinian community in Ramallah? Does it vouch for their interests? But what is this interest? What would this bid accomplish? It would certainly bring about positive changes for Palestinians. Having a permanent seat – and a permanent voice – at an international table will permit them not only to check Israel’s actions and illegal expansion of settlements further into Palestinian territory but to bring pressing issues more frequently to the world’s attention. But let us entertain, for a moment, the notion that this indeed constitutes a “bad peace”. ‘The truth is that Israel wants peace. The truth is that I want peace,’ Israeli Prime Minister Binyamin Netanyahu said in his address to the General Assembly. Since Israel opposes Palestine’s bid, it presumably has a ‘better’ peace in mind. What, then, would this ‘good peace’ really entail for the US and Israel? What does it mean to leave Israel and Palestine to work things out by themselves? Here, appearances are not at all deceiving. As Groucho Marx said, “he may look like an idiot and talk like an idiot but don’t let that fool you, he really is an idiot”. What happens when a weak state – which relies substantially on foreign aid and has 70% of its population living below the poverty line, and 40% unemployed (CIA World Factbook, 2009 and 2010 est., respectively) – is forced to deal with a much stronger state (with remarkable military potential, nuclear arsenal, and the backing of the biggest military power in the history of the world) with no outside interference? The stronger state will have the upper hand and demand nothing short of full submission to its own terms. This is the ‘lasting’ and ‘good peace’ the ‘honest broker’ US and its ally Israel envision, and it had been serving Palestine’s interests greatly until the Palestinian Authority (PA) decided to spoil it with their bad and ‘shortcut’ peace. Indeed, since the release of the Palestine Papers in late January, we have seen, as whistleblower Ziyad Clot described, how “the peace process [through Arab-Israeli negotiations]is a spectacle, a farce, played to the detriment of Palestinian reconciliation, at the cost of the bloodshed in Gaza” (CLOT, Il n’y aura pas d’Etat palestinien). And we have become all too familiar with the remarkable achievements of this ‘good peace’ or ‘peace process’ as prescribed by the US and Israel. It is the ‘good peace’ of stalemating and conquering. It is the ‘good peace’ of either maintaining Palestinians in a state of constant imprisonment in Gaza and in the West Bank or displacing 700,000 of them, as happened through al-Nabka (1948), thus condemning an ever increasing number of them to a life in refugee camps and in exile. It is the ‘good peace’ of “pacifying” 1,400 Palestinians during the 22-day Israeli offensive in Gaza which began on 27 December 2008. It is the ‘good peace’ of the Separation Wall, the continuous annexation of Palestinian territory and expansion of Israeli settlements. It is the ‘good peace’ of growing Israeli control over currently 80% of Palestinian water supplies. It is the ‘good peace’ of some 1,5m Arab Israelis (approximately 20% of Israeli population), many of whom live not as 2nd, but as 3rd, 4th or 5th class citizens of the “apartheid” (UN Resolution 3379, 1975) state of Israel. In short, it is the good “old” peace which has worked to its Israel’s advantage for the past 63 years, as opposed to Palestine’s “bad peace”, which, although symbolically benefiting Palestine, does not prevent the safe existence and governance of a sovereign Israeli state. However tragic this description may appear, certainly it does not follow from it that Palestine is waging its struggle against the world, or against the UN Charter’s so-called “we the peoples.” In fact, “we the peoples” support Palestine’s bid for statehood (49% for, 21% against according to the same 19-country BBC poll). The same applies to the majority of the world’s governments, which have assured their support through more than 120 countries out of the 193 of the UN General Assembly. Clearly, Palestine’s UN statehood bid cannot even be called “The Palestine Debate”, as Al Jazeera put in a headline on its website, but rather, as Noam Chomsky described it, the ‘overwhelming international consensus’ towards the country. Despite US pressure over three members of the Security Council – Bosnia, Nigeria and Gabon – this international consensual trend may follow suit at the 15-ranked UN Security Council, and thus lead to the more than likely outcome of a unilateral US veto. Clearly this is not – nor has it been for some time – Palestine vs the world, but rather the World vs US. For a country that sees itself as a specialist in bringing countries together under a common banner, it has failed demonstrably in bringing itself together not only with the international community, but – as we have seen – with its own population under a common banner of Palestinian self-determination. What happens when an unstoppable force (the greater part of the world, including US citizens) meets an immovable object (US government)? For the latter (as for all countries with veto-power) there has never been any paradox here – the immovable object will prevail, as it did prevail for 32 times in favour of Israel in the 69 vetoes the US exercised during the 20th century (1970-1997). Next week the world will most likely witness another bureaucratic victory for the US and Israel, but a no less victorious moral win for Palestine which will isolate the two countries even further from the rest of the world and from their own populations. I think your final point is the crucial one: the statehood bid will be defeated, but it will increase Israel’s isolation, making real concessions more likely in the future. A Palestinian state created under current conditions would be something of a disaster, betraying millions of Palestinian refugees and not solving the issue of settlements cutting the West Bank into ribbons; but an Israel weakened at an international level will make a more satisfying solution much more likely. In truth, only the one-state solution can now bring peace without ethnic cleansing. You’re making an important point there, Malte. However, will Israel will ever concede or subscribe to a one-state solution? I think this is more unlikely than a two-state solution. Even the solution of a bi-national state (possibly the best option) must go through the theoretical basis of a two-state settlement.